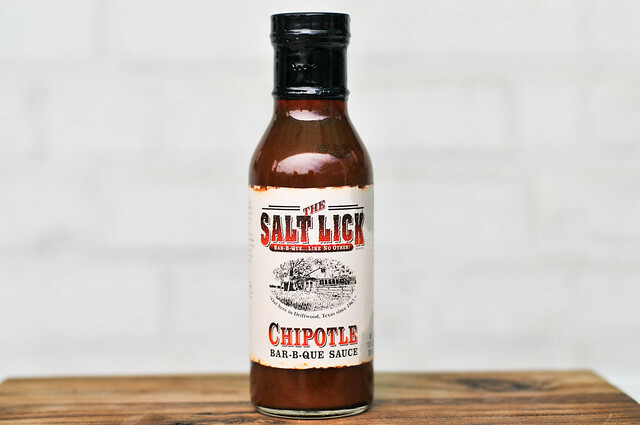 Lacking the intense sweet mustard flavor of the Original recipe that made it so addictive, the Salt Lick's Chipotle Bar-B-Que Sauce falls a little flat in comparison with it's more muted flavors and mild heat. The Salt Lick got its start in 1967 when Thurman Roberts, Sr. and Hisako Roberts opened their Driftwood restaurant with a focus on cooking meats in the fashion way as their pioneering parents. The restaurant steadily grew in popularity to where it's at today, with Scott Roberts at the helm of three different locations, a mail order business, and a national distribution of their sauces and rubs. 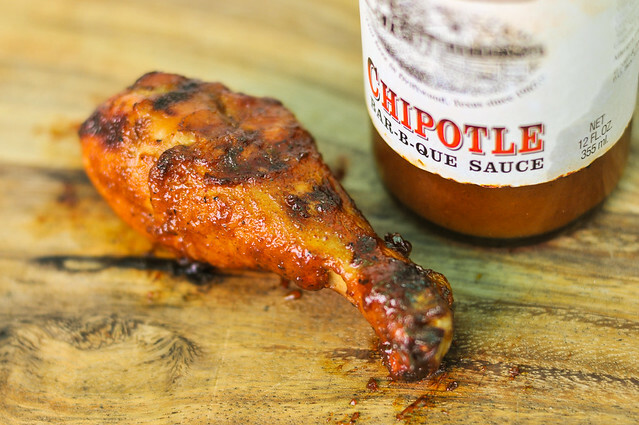 The aroma of the Chipotle recipe is very similar to the Original, with a light sweet and tangy honey mustard smell. There's only the faintest hint of spice here, with almost none of the hot and smoky chipotle you might expect based on the name. When I first opened the jar, some of the sauce had separated and there was a thin oily sheen at the top. A quick shake fixed that, and I poured out a very smooth, medium thin sauce. Through its light rusty-red hue, a few specks of visible spices can be seen here and there. Dripped from a suspended spoon, the sauce flows in a fast, steady steam that slows to a drip as most of the sauce leaves the spoon, leaving only a very thin coating clinging. 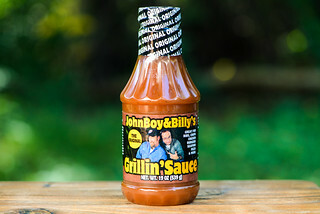 Mustard dominates this sauce, which starts out with a sweet flavor that then begins to mix evenly with a vinegar tang. There's also a strong tomato component that neutralizes some of the mustard flavor and sweetness compared to the Original Recipe. 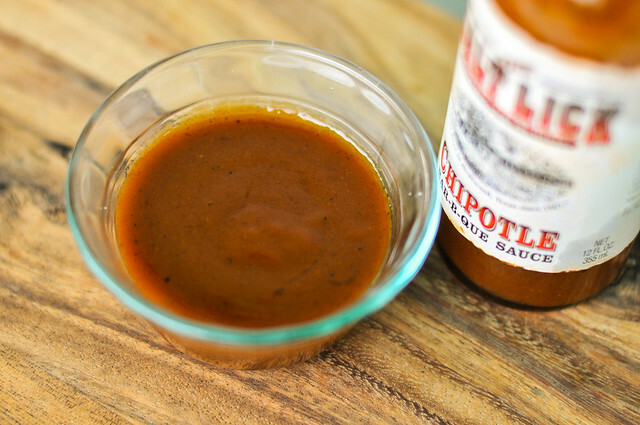 As the sauce settles in, some spice comes out, which has only a slight smoky flavor of chipotle. The specs of black pepper leave little pockets of burn on the tongue that break up the otherwise sugary aftertaste. This sauce baked in and caramelized well on the chicken, although the coating was light due to the sauce's thin consistency. Much like the Original Recipe, a lot of the flavor out of the jar was lost or very diminished after being cooked. The heat did give it more flavor to speak of, comparatively, but all-in-all it was very mellow and subdued. While I found the Salt Lick Original Recipe's honey mustard flavor incredibly addictive, I can't say the same about the Chipotle. The distinctive sweetness of the Original is still there, but to a lesser extent, and with only a mild heat, that void is not quite filled. Still, it's a very well balanced and delicious sauce, one that would serve you well as a condiment and would be especially good as a dip for chicken, where the sweet mustard tang and mild heat could shine, but not totally overpower.